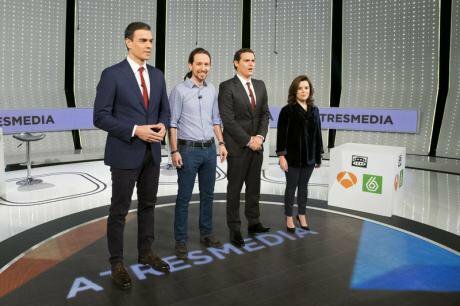 PSOE leader Pedro Sanchez, Podemos leader Pablo Iglesias, Ciudadanos leader Albert Rivera and Vice President of the Spanish government and Partido Popular Soraya Saenz de Santamaria at a live television debate. Demotix/Oscar Fuentes. All rights reserved.Admittedly, the Podemos phenomenon is a unique case in political science and highly deserves the attention and recognition it has generated. At the very least, the Podemos project has achieved the opening up of a mediated framework situated in deliberative democracy and the general interest, the common, alongside the widely circulated renewal of 15-M discourses. All of these aspects are, I believe, undeniable. The question posed here is whether this political experiment will come to be limited by a theory and political practice that is by any standard debatable, as concerns its concept of communication as well as the struggles that relate to capital and class identity. That said, we begin by recognizing two fundamental contributions that Podemos has made. Firstly, Podemos has given a central role to political communication, historically a weakness in left-wing political movements. Podemos’ electoral programme included important measures concerning the transformation (and not a commodified, market-oriented transformation) of the symbolic sphere. What the party promises is a political culture for the citizenry that features active participation of the population and an institutionally renewed democracy, marked by transparency; at its best, the Podemos project articulates communication and culture from what may be called a ‘transversal’ (or cross-hatched) conception. Secondly, Podemos has, moreover, innovated from the point of view of what may be called ‘technopolitics’; that is, it has employed forms of dialogue with the citizenry mediated by a creative and intelligent use of social networks in a manner suitable to a conception of democracy 4.0, or what Cava has called ‘Populism 2.0’. This approach broaches not only a different reading of class composition but is further virtuous for its new strategies and vernaculars that connect with the rising generation of internet-istas and the contemporary cyber culture. That is, Podemos’ implicit form of institutional action relates a conception of proactive endeavour and the Internet citizen in a manner that fully recognizes the necessity of defending this cooperative space. Podemos promises politics that are not ‘mercantile’-- that is, distinctly not commodified and market-driven--in order to appropriate the use of virtual spaces in pursuit of the project of institutionally-oriented communication on behalf of stakeholders. While recognizing both of these contributions from the party’s emergence, nevertheless limitations follow from the Podemos experiment. Political communication is not only a question of employing mediums but also of mediations. That is, despite the upsides of its project noted above, the mediacentricism of Podemos is the Achilles heel of a strategy designed with apparent initial success. The mediacentric approach has relegated the Podemos movement to a lesser role at the moment, surpassed by a force of the political right; namely, the party that goes by the name Ciudadanos (‘Citizens’) that enjoys the support of the information sector corporations that dominate the public sphere. To mortgage all political communication to media is a mistaken deal from a perspective informed by the political economy of communication. The possibilities of political communication on television depend precisely on undermining the hegemony of capital, which imposes limits that are very difficult to exceed, given the power of vested interests. The power of mediation demands a strategy that is both inside and outside the mediums--a very tall order, given the interpolated subjects of discourses who have been mediatized by the flow of information that is, in turn, dominated by the conjoined power of mainstream media organs. In this view, Podemos’ reading of Laclau’s populist theory of communication politics results in an error. The evolution of these events in Spanish politics demonstrates that to think the constitution of a new political subject can arise from within the hegemonic situation of media is to end up with a mediacentric reductionism; a reductionism with too little in the way of politics and still less that is transformational. If capitalism depends on its political-affective constructions, it does not follow that indetermination of the socio-discursive field would be absolute or liberating; still less if we analyse the hyper-concentrated structure of power in the journalism industry in countries like Spain. The floating signifiers presuppose and demand political subjects who would know how to swim. We know that the idea of the political centre, on this view, is so diffuse as to assume all space as fluid and mutable; and for the same reason, a fluid, mutable “centre” presents the propensity to shipwreck subjects who move themselves into this space (as in for example, the displacement of Podemos voters to Ciudadanos). The discourse and the notion of a public or a people (el pueblo) are by definition opaque and both defer the theory of why events (do, do not) happen, as these come to bear on Podemos. Allow me to clarify. To think that political identities are not determined by economic relations and concrete social facts--that is, to think that these are basically discursively modelled--disables the transformation possibilities of new subjectivities as well as for historic change. By contrast, in being mindful of material constraints, critical theory demonstrates that subjectivity and change are all about a process of production and something more than cultural democracy via the market place or the free exchange of signifiers. Language and work, hand and brain are historically connected. It is not possible to disentangle the universe of discourse from the necessary conditions of lives lived in common. In other words, a process of change is not possible without ourselves facing up to the materiality that mediates all theory and all social action. To avoid being reductively deterministic in deploying a conception of the popular reliant on inconclusiveness, there must be anchors in the real. This is the ill-considered difference in the thinking of Gramsci that arises via Laclau’s interpretation. As I understand it, Laclau lacks a diagnostic within a structural vision; more Bourdieu, please, and less semiotic-centricism. As it stands, Laclau promotes a new idealism about autonomy and the indeterminancy of the symbolic—and he does so largely as if there are no structures of class and rules of the game of access to symbolic capital. This lack of reflexivity leaves the mediated operation of floating signifiers blowing in the wind without consistency, vulgar, not held in common, enveloped in the banality of the new kitsch. The reliance on floating signifiers ushers in a game of thrones proper to the world of spectacle, where creativity and the invention of other imagined worlds is only possible in discourse; that is, in a performative sense, without changes to reality, without intervening in the literal bases and materials of the life world. The calculated ambiguity of language, the indetermination of the empty floating signifier, tends toward accommodations to the current moment and does so through mere tactics. As in the 1980s, the political communication of Podemos shares the fetishism of commercial communication that appealed to brands and public relations to resolve the structural crisis of capitalism. What is surprising is that many intellectuals of the left share such a vision of pan-communicationism. This is a vision that has denied an idea fundamental to the whole emancipatory project: to wit, submission to the belief that the pure signifier and the logic of symbolic interchange alone open the way to universal equivalence. For this reason, we say that Podemos participates in an impoverished understanding of the relation between theory and reality, between communication strategy and practical politics. It is a moment to stop to think and at the same time, to mobilize hearts and minds. Critical theory is the thing that illuminates the clues, connects and modifies perspectives, monitors new cognitive horizons, captures in its essential complexity the marvel of the life held in common. And critical theory demands that we remember that all connection, all relational systems are by definition contradictory. Moreover, relations are not only imaginary, not simply ideals, but are also the products of experiences mediated by power interests within situations in which the position of the observer is unequal and not equivalent. As Gramsci teaches, it is not possible to think “outside”, since the myth of exteriority is not possible. The study of long-term historical dynamics permits analysis of contemporary problems with specified criteria and in terms of relationships. As Mandel warned, we should not disconnect the history of above (i.e., by, for, and of the ruling elites) from the structures of the history of the same as seen from below. Near the start of the Gramscian image of articulation of doubly articulated power, the challenge arises to systematize and to develop Marxism as a scientific theory, as practices of social dynamics, as objective and subjective conscience in addition to the ‘pressing ideological unconscious’. b. - The superstructural reading that, conversely, exiles and forgets economic conditions and the relations of production, a tendency that has triumphed in North America and England in their pursuit of cultural studies. What do we have? The return of history to politicize the interpolation of the figure of the intellectual and historical commitment bursts through the sociology of rhetorical deconstruction, the linguistic turn and the hypersymbolization of micropragmatism, developments implicit in cultural studies. What does it all mean? In this place, it is vital to transcend the absence of essential theory, beginning with the critique of the capitalist unconscious that today dominates thinking by positing the false dichotomy of individualism/collectivism. Beginning with the basic, driving idea in Marx that social facts of thought, such as a society’s scriptures, are of and within exploitation and not something else, presents a start to a new project. Only beginning with the radical materiality of this originally Marxist logic is it possible to comprehend unconscious ideology--the fear of having fear--a common feeling for all subjects who have asked themselves ‘what is to be done’ in times of epochal change. In the towns and cities of Spain, the people do not await a communication-oriented response to their problems, but rather alternative transformations. Mediated products have a rapid obsolescence. The problem is that they do not enable the landscape of hope for some. Now the media products are fast-fading and the floating signifiers do not serve any more. There is a need for setting up the return of the real and the concrete, with all its thickness and complexities. Perhaps after the readjustment of the media and a reduction to innocuous flickering onscreen, some will rediscover a fundamental principle. That at least we hope, for the good of all, for the common good.